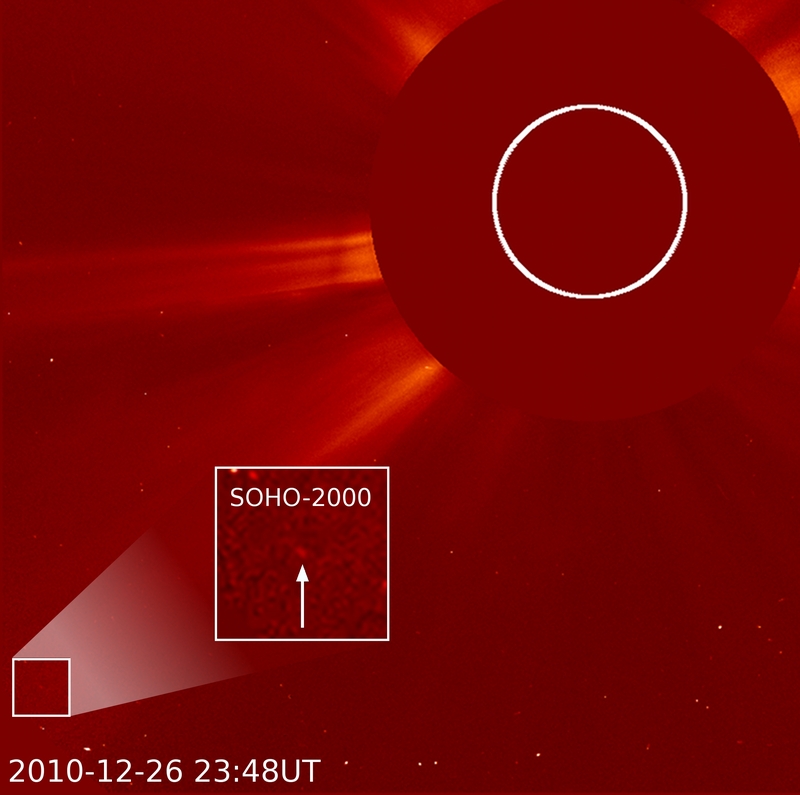 On December 26, SOHO discovered its 2000th comet. Drawing on help from citizen scientists around the world, SOHO has become the single greatest comet finder of all time. This is all the more impressive since SOHO was not specifically designed to find comets, but to monitor the sun. Quicktime Large (780K) and Small (261K) movies. Of course, it is not SOHO itself that discovers the comets -- that is the province of the dozens of amateur astronomer volunteers who daily pore over the fuzzy lights dancing across the pictures produced by SOHO's LASCO (or Large Angle and Spectrometric Coronagraph) cameras. Over 70 people representing 18 different countries have helped spot comets over the last 15 years by searching through the publicly available SOHO images online. 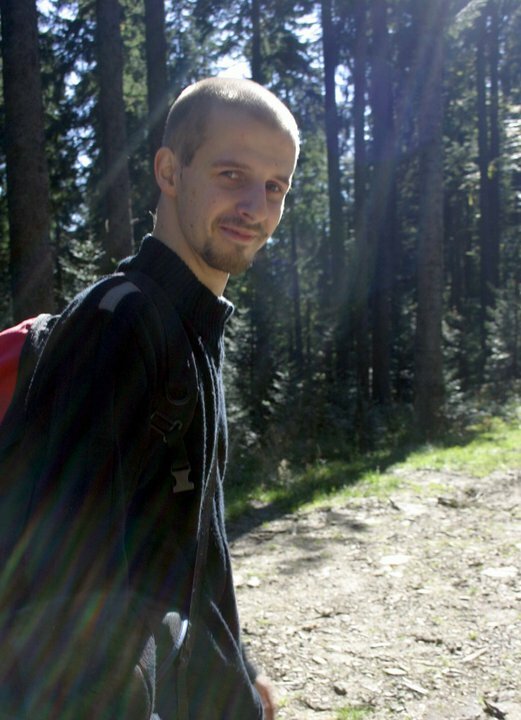 The 1999th and 2000th comet were both discovered on December 26 by Michal Kusiak (photo below), an astronomy student at Jagiellonian University in Krakow, Poland. Kusiak found his first SOHO comet in November 2007 and has since found more than 100. It took SOHO ten years to spot its first thousand comets, but only five more to find the next thousand. That's due partly to increased participation from comet hunters and work done to optimize the images for comet-sighting, but also due to an unexplained systematic increase in the number of comets around the sun. Indeed, December alone has seen an unprecedented 37 new comets spotted so far, a number high enough to qualify as a "comet storm." LASCO, the instrument on-board SOHO that has been used to find comets, was not designed primarily for that purpose. The LASCO's camera blocks out the brightest part of the sun in order to better watch emissions in the sun's much fainter outer atmosphere, or corona. LASCOâ€™s comet finding skills are a natural side effect -- with the sun blocked, it's also much easier to see dimmer objects such as comets. Approximately 85% of the comets discovered with LASCO are thought to come from a single group known as the Kreutz family, believed to be the remnants of a single large comet that broke up several hundred years ago. The Kreutz family comets are â€œsungrazersâ€� â€“ bodies whose orbits approach so near the Sun that most are vaporized within hours of discovery â€“ but many of the other LASCO comets boomerang around the sun and return periodically. One frequent visitor is comet 96P Machholz. 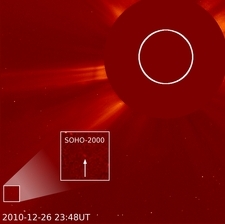 Orbiting the sun approximately every six years, this comet has now been seen by SOHO three times. SOHO held a 2,000th comet contest to see who could come closest to guessing when the 2000 comet would reach perihelion (closest approach to the Sun). The three closest guesses will be sent some nice solar-related prizes. Comet perihelion time was Dec. 27, 2010 at 0800UT. Erik Olson of Carpinteria, CA had said it would be 13:36UT that day. Naoto Tatsumi, Okayama, Japan guessed 23:59UT that day. Bill Rankinen of Conneaut, OH guessed Dec. 24 at 18:34UT.